With the 200th anniversary of the war of 1812 fast approaching, many historic sites from that period are sprucing up and new material about the war and its battles are being written. I have read and studied the conflict for quite a few years and now like to concentrate on campaigns, battles or individuals involved in the conflict. I was quite excited when I saw Niagara 1814: The Final Invasion. The War of 1812 (or the American War as it is known in Britain) has the strange distinction of being a war largely forgotten by both of its main participants. Despite being overshadowed by the Napoleonic Wars raging in Europe, the War of 1812 saw Americans, British, Canadians, and Native Americans wage an increasing brutal conflict all along the border. By 1814, with war coming to a close in Europe, the Americans decided to launch one last, major land offensive in an attempt to seize Canada. Although previous attempts had most often ended in disaster, the American army of 1814 contained several highly trained units under competent leadership including the legendary Winfield Scott. This final Niagara campaign saw a number of pitched battles including Chippawa, Lundy''s Lane, and Cook''s Mill, where the American Bluecoats matched the British shot for shot. However, due to poor planning at the highest levels of American office, the campaign was ultimately a failure and the result ensured the survival of Canada as an independent state. A critically-acclaimed researcher on the War of 1812, author John Latimer presents a new look at an oft-forgotten yet crucially important campaign in the history of North America. Most of the books written have been written by Canadian and U.S. authors/historians so it was most interesting to read one written from the British viewpoint. Latimer describes the period and the battles in a very effective, comprehensive and entertaining manner. There were things which I learned from this book. Also he did well to describe how the events with Napoleon not only affected the war in Canada but how the decisions made also affected Napoleon's escape and the Battle of Waterloo, something rarely looked at. It is well-illustrated, although the coloured prints by Graham Turner I felt were quite ineffective. When I saw the cover of the book, I almost put it back, thinking it was a children's book by the quality of the drawing. All the faces of the English forces shown were the same. Maybe they were triplets! The maps were well-drawn, with excellent accompanying description attached as to the order of events. I did laugh at one line, which proved it was written by someone from England. "Izard had blown up Fort Erie in a pyrotechnic display worthy of Guy Fawkes Night." If I hadn't watch "V for Vendetta", I would not even know who Guy Fawkes was. 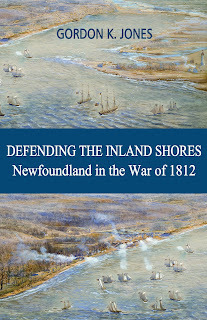 This is an excellent read for anyone interested in the war of 1812.